Why is lean bad for you? Okay, so before I start, I understand this is a weird topic to choose. But I do think it is relevant because lean is a big trend in pop culture right now. For those of you that don’t know what lean is, you’re better off that way. For all intensive purposes, I am still going to tell you. Lean is a drink mixture of codeine and Sprite. It’s that simple. You would think it wouldn’t be bad because codeine helps you when you’re sick and Sprite is just good soda. Who knew something so simple could be so dangerous? The lean fad was popularized by the rap community. 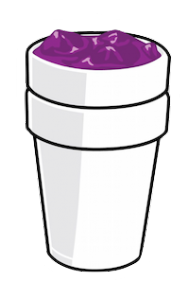 There have been many lean related deaths, primarily in the hip-hop/ rap industry. Coincidence? I don’t think so. The whole reason I got this idea was because an artist/ producer by the name of A$AP Yams birthday was on November 13th, and he actually passed away on January 18, 2015 due to an overdose of codeine. He was using it for recreational purposes. Another case of near death happened when rapper Lil Wayne started seizing due to consuming too much lean about a month ago. His plane had to make an emergency landing and he had to be rushed to the hospital to keep him alive. He had history of seizures in the past due to drinking lean. Hopefully by now you can see the dangerous effects of overconsumption of codeine. A recent randomized control trial study on 61 college-aged students showed that most of the students that were prescribed codeine by their doctor said they were happy about that. Happy in a sense that now that they have it, they can do the cool thing and drink lean. This shows that not only is the use of lean popular, but people actually think highly of the drug and don’t find issues in its use. One other longitudinal study was done in a community where participation in the study was advertised through newspapers. People just had to fill out a survey about their use and symptoms they felt. What was found is that their was a correlation between the misuse of codeine and depression. It was also found that a dependence on the drug was common. According to the Addiction Center website, codeine is an opiate. This means that it is very easy to build a tolerance and eventually a dependence on the drug. Opiates are highly addictive and include drugs such as: Heroin, Oxycontin, and Morphine. Many people are often unaware of codeine’s addictive properties because it a prescribed medication. My plan with this blog is to make you just a little more aware of the issue. So now the question is, what can we do about it? Well, honestly, not much. The best thing you can do for yourself is to stay away from lean. I wanted to educate you more about the topic because I know that its popularity is increasing and I don’t want anyones lives to be cut short by it. Overall, codeine is an opiate that, if misused, can become highly addictive. Lean has been to know to cause death due to overdose and seizures. None of us want to end up like A$AP Yams or go through what Lil Wayne continually goes through so, why take the risk? This entry was posted in Uncategorized on November 14, 2016 by gcm5149. It’s that time of year again, as we set our clocks back an hour, we “fall back”, essentially gaining back 60 minutes. 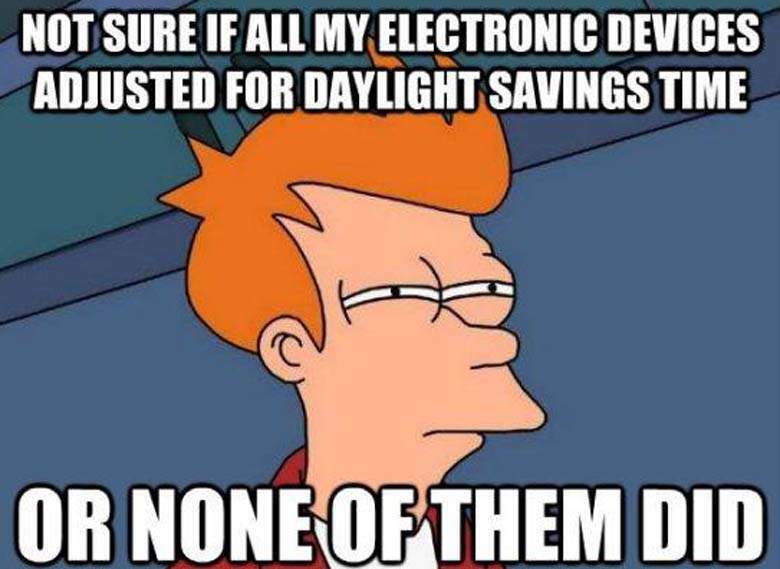 Though many people are less aware of Daylight Savings Time due to the fact that most of our technology adjusts automatically now, the effects can still be noticed. I decided to write this blog as I became intrigued about how this time shift impacts us. How does this affect our lives? 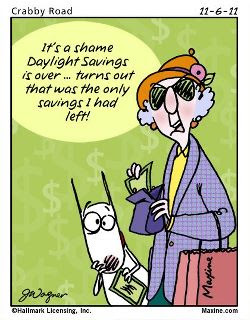 Do these changes differ from daylight savings in the spring? Looking back two weeks ago, did you feel more awake when you woke up? 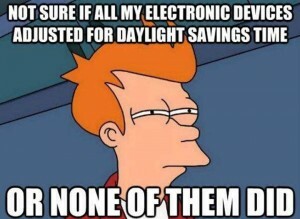 The first thought that pops into my head when it comes to Daylight Savings is sleep…I think we all can agree on this. I know that I am either going to have an extra hour in the Fall or lose one in the Spring—pretty simple concept to grasp. As a result of this I’m either going to feel refreshed OR more tired than usual the next day depending on which Daylight Savings Time is occurring. In the JSTOR article, “Losing Sleep at the Market: The Daylight Saving Anomaly”, the effect of Daylight Savings is compared to that of jet lag, pointing out that a change in our circadian rhythm (a process our body goes through over the course of 24 hours) can lead to either feeling ahead or behind. Thus, backing up, while also making logical sense of my thought process on this event. Looking more into this topic, I came across a study that was done with 48 people, where their wake up times were observed the week after daylight savings as well as the week before (controlled trial). It was found that wake up times were effected and took about a week to adjust after both the Spring and Fall time shifts. It is noted that more people relied on a force wakeup by an alarm clock in the Spring due to the less sleep, meaning that it was found to be more difficult to wake up on their own. This showed me that the effects of Daylight Savings can differ between Fall and Spring even though both instances seem to impact us. While researching on this topic, I came across a study done about how Daylight Savings could cause more car accidents to happen. WHAT? Never would I have guessed that this would be an outcome of switching the hours on my clock. When I saw this I was pretty skeptical at first being that Andrew taught us that correlation does NOT equal causation. I figured it could probably just be a coincidence that more people were getting into accidents around this time frame. This study was done over the course of 21 years by observing the amount of fatal car accidents on the day before, of, and after, during the weeks of and after Daylight Savings time. Basically researchers tried to see if there was any change in the amount of crashes that took place after daylight savings in comparison to the amount on a normal basis. It turns out that there did seem to be an increase. Furthermore, it was found that there was a more significant increase in crashes in the Fall than in the Spring. The main reasoning for this is the gaining of an extra hour, causing people to stay out later than normal resulting in being drowsier, less attentive at the wheel, the next day. Though this is an issue that not many people know about or even realize, it does not necessarily mean that it suffers from the “File Drawer Problem”. As we learned in class, this problem happens when results fail to become well known or published because the results do not show a change, in other words we fail to reject the null hypothesis. So if the null hypothesis is that there is no increase of accidents during the daylight savings period, then in this case we would reject the null hypothesis. It’s interesting to see that the act of putting our clocks ahead an hour or back an hour can produce changes in not only our state of alertness but also that this can carry into events of our everyday lives, like even driving a car. A side note: with that being said, try to avoid the roads on the day after Daylight Savings (more so in the Fall!!) Taking this precaution could save yourself from just one of the effects caused by Daylight Savings!! This entry was posted in Uncategorized on November 14, 2016 by Jen Malespina. In my last post, I researched the safety of planes and the risk of air travel. I found it ironic that I then stumbled across this article which compared the two forms of travel. According to the article, for every 100 million miles driven, about one fatal car crash occurs. This statistic is alarming compared to the almost non-existent deaths that occur over the millions of miles that airplanes fly. Over-all, the number of people who die in cars is astronomically bigger than the amount of people who die in planes. This striking statistic is only a brief outlook into the dangers of driving. It seems as though cars being dangerous is not a new idea. According to the New England Journal of Medicine, death by car crashes have long been a problem. Back in 1925 when cars were a new technology, about 1 out of every three people who died in a car crash was a child. However, the article brings up an interesting point. Car crashes are not the only dangerous thing about cars. Cars are technology, and as well all know, technology has the tendency to fail every once and a while. Cars had a habit of causing fires when they were first being made, which was a threat to users. Cars also had an adverse effect on people’s health, making users less in-shape and leading to some bone and joint problems. There are many reason as to why people get into car crashes. One of the most obvious reasons is age. It is no secret that teen drivers pose some of the worst threats to other drivers. Science Direct article states that new drivers account for over 120 crashes per every 10,000 miles crashes within the first month of their driving experience. This number does tapper off as they get more and more experienced, but it really is shocking to see just how much havoc young drivers wreck on the roadways. Drivers also faces many other dangerous factors. Situations involving drunk driving, driving while exhausted, and many other things make driving a dangerous game. Over-all, driving is a pretty risky business. It not only is yourself that you have to worry about, but it is also other people you must worry about. When you chose to drive a car, you put yourself at risk for a multitude of bad things to happen to you. However, I don’t think this should stop people. Life is full of risks when you really think about it. However, we can only control what we can control. As long as people are smart and heads-up when they drive, they can eliminate a lot of risks. Stay safe, drivers! This entry was posted in Uncategorized on November 14, 2016 by Margaret Marchok. I am terrified of planes. Yes, you heard me. I hate flying. I’m not really too sure why but the whole idea just freaks me out. Whenever my family and I fly somewhere, my dad always comforts me by telling me that “flying is safer than driving a car.” That is why I have found it ironic that recently in class we have been comparing different risk factors to the risk factor of driving a car. All this talk of risk has recently gotten me interested in finding out just how safe airplanes are, so I decided to do some research. A major part of my fear of flying comes from the fact that I simply just don’t understand how they work. I don’t like how I am not on the ground. Also, being so high up freaks me out. The first thing I did was research how planes work. I happened to stumble across this NASA article. According to the article, lift is a major factor in the initial step of getting the airplane off of the ground. Airplane wings are specifically designed to create a greater force of air under their wings than on top. Engineers achieve this by designing the wings to move air on top of the wings more quickly than air under the wings. This allows the air on the bottom of the plan to act as an upward force on the machine. Once the plane has been lifted, it turns to its engines to propel it through the sky. Next, I decided to delve into the safety factor of airplanes. According to this website, one major concern in the world of aviation today is the computer software that is used to fly planes. The article notes that the first question that comes to mind when dealing with the issue of technology in planes is whether the technology can be fully trusted or not. Sure, technology is great when it works, but what happens when it doesn’t? Without a backup plan to the technology, that situation could become detrimental. That also brings me to the next point the article made about airplane technology. Another issue that comes up is airplane pilot’s understanding of and relationship with the technology. The article mentions that this issue is the cause behind a lot of airplane incidents. If pilots don’t understand the technology fully it is too complicated, it hinders his ability to perform his job to the fullest. Another great point about airplane safety is how safe you actually are on the inside. According to this article, clinics are beginning to see a rise in the number of patients who report cold symptoms and nausea after flying. This had lead some people to believe that air inside of an airplane cabin has the ability to make people sick and is not conducive to people’s health. However, because of these claims, some companies have taken it upon themselves to do research on whether the air is safe or not, and their results have turned up clean. It turns out airplanes are actually very clean places, which leads me to believe that confounding variable are at play. People could perhaps be experiencing some underlying anxiety about flying which then in turn causes them to feel sick. Also, there is always the possibility that they contracted their illness before they flew, and their flight just happened to be at the same time that they began to see symptoms. Over-all, I actually believe that the risk of taking an airplane is quite small. Sure, there are always possibilities for things to go wrong, but that is life. Airplanes rarely crash, and when they do, they create a shock throughout the world because it is something we are not used to seeing. Even though I still am scared to fly, I feel better knowing how planes work and that people are continuously trying to make them safe. I have always thought it was interesting how caterpillars have the ability to pretty much change into a completely different animal during their life. To be honest it doesn’t really make much sense to me because for half of their life they are able to move about a foot every twenty minutes, and then the other half they have wings and can fly. But my big question is if they remember the time before they could fly. According to Nancy Miorelli, an entomologist, caterpillars don’t know that they are eventually going to turn into butterflies. She compares it to humans going through puberty; we have no control over the hair that grows on our body during that time. Just like us, hormones signal the body to start growing, but it’s not until the juvenile hormone is no longer present that they transform into the cocoon (1). 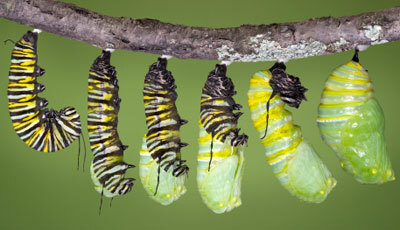 Scientists’ previous understanding of what occurred inside of cocoons was that the caterpillar turns to complete mush before it reforms into a butterfly. But just like we have heard in class many times, scientists can be wrong. It is true that most of the insect dissolves, however most of the vital organs stay pretty much intact with some minor alterations in order to be more effective in the new body. For example, the tracheal tubes grow larger because the butterfly is going to need a greater amount of oxygen because it is exerting more energy flying. The brain is a different situation. The brains of insects contain many different segments. One particular segment is in charge of smelling, taste, learning and memory. Miorelli explains that these factors are vital to the organism’s survival throughout its entire lifespan that they are unchanged during the transformation. The remainder of the brain becomes new and improved for the insects new and improved body. 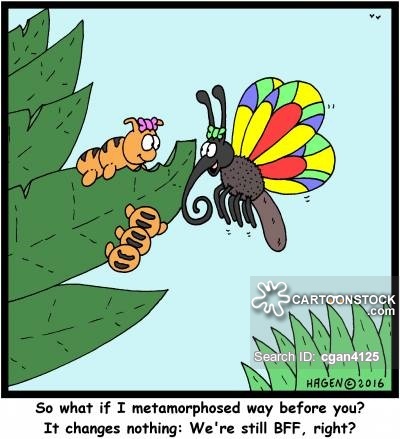 From Miorelli’s statement about memory remaining intact through both the life of the caterpillar and butterfly, we can assume that my question about butterflies remembering being caterpillars right?! There was a randomized control trial performed by the University of Edinburgh in the U.K. in order to prove exactly that. Manduca sexta caterpillars were electrically shocked in combination with a distinct smell to train their distaste for that specific aroma (2). The null hypothesis in this experiment was that the caterpillars would not be able to remember their aversion to the smell post metamorphosis. The alternative hypothesis was that the caterpillars would remember their aversion to the smell post metamorphosis. Interestingly enough, their distaste was still present after experiencing several molts, but was no longer present after metamorphosis. The scientists concluded that in order to retain a memory once the organism is a butterfly, it needs to occur in later stages in the larval time period. The scientists then tested larvae more developed than the original group. The scientists’ prior conclusion was correct because the butterflies that were tested later in their life remembered their distaste for the odor. Additionally, it is possible that this field suffers from the file drawer problem because in the documentation of this study it stated that there were no competing studies. Overall, butterflies are able to remember some stuff from their caterpillar life, but from what I can see here it is strictly biological and in relation to their well-being. I doubt that the butterflies can remember personal experiences that they had as a caterpillar, but then again I don’t even know if insects even have those. Source 1: Miorelli, Nancy. “What Happens Inside a Cocoon?” Ask an Entomologist. N.p., 07 Mar. 2015. Web. 21 Nov. 2016. Source 2: Blackiston, Douglas, Elena Casey, and Martha Weiss. “Retention of Memory through Metamorphosis: Can a Moth Remember What It Learned As a Caterpillar?” PLOS One. PLOS, 5 Mar. 2008. Web. 21 Nov. 2016. This entry was posted in Uncategorized on November 14, 2016 by Anna Strahle.